« On the lookout for DAPs! Gather ’round, and I will tell you the tale of the Matrix Beetle. It began in England — London, to be precise — during the second half of my two-year NSERC postdoc. I had spent the first year in New York at the incredible American Museum of Natural History, and decided to spend the second in the UK at the equally remarkable Natural History Museum. Time well spent in both cases. In London, I joined the lab of Alfried Vogler, an expert on tiger beetles, accomplished molecular systematist, and all-around excellent person. Alfried is, like many of my colleagues, interested in the applications of molecular tools to the problem of identifying the probable 10 million species on the planet. He takes it a step farther in some cases and would like to see a “DNA taxonomy” and not just “DNA barcoding” (there is a big difference, folks), but the basic point remains that he is interested in exploring how modern genetic methods can inform the identification of life. Every Friday at the NHM, people would gather for inexpensive (by UK standards), though certainly not cheap, beer; it was here that I discovered Leffe, which, to my delight, is also available in Canada (at the LCBO, not the Beer Store, in case you’re looking for it in Ontario). One evening whilst enjoying said brew, Alfried remarked that someone in the lab had shown him a DNA sequence that morning, and that he had looked at it and said “That’s not from a tiger beetle”. He then noted — jokingly, of course — that if he had seen the real beetle he may not have been so sure. “What are you, like the Matrix?,” I snorted, “You just see DNA sequences raining down all over?”. Deciding to follow up on this amusing notion, I created an image of a tiger beetle as seen in a Matrix world of DNA sequences. I put this on the computers in the lab, and hilarity ensued. Someone joked that it would be funny if we managed to get that on a journal cover. I agreed, but left it at that. For those of you who follow the literature, you’ll know that there is a vocal opposition to DNA barcoding. Most of this comes from (some) taxonomists who see barcoding as a threat to their discipline. A debate on this issue was held at the PEET meeting in 2004 (watch the video), with a follow-up “discussion” to be held in the pages of Systematic Biology. By this time, I was back in Guelph, and Paul Hebert and I were neck deep in writing a multi million dollar Genome Canada grant (which, incidentally, took exactly $0.00 from the pockets of taxonomists and delivered a sizable chunk of funds to many non-molecular types). As a result, Paul was regretfully planning to withdraw from submitting his paper to the journal issue. I thought this would be a mistake, busy though he was, because it would have let the anti-barcoding side have the only word. We agreed to work on the paper together, which consisted of answering a series of questions that had arisen from the PEET meeting. When the papers were accepted, the journal editors asked if anyone had ideas for a cover image. On a lark, I sent in the “Matrix Beetle” — and they wanted it. 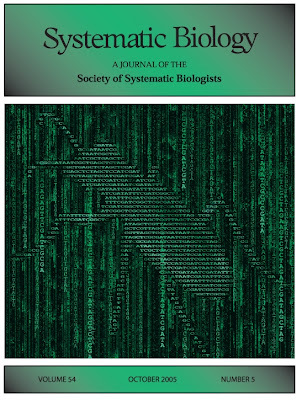 Cover Illustration: The recent proposal to use short, standardized gene sequences as unique identifiers of species – known as DN barcoding – has generated both strong support and vocal opposition in certain biological circles. The potential impact of DNA barcoding as either a help or a hindrance to taxonomic research represents an especially polarizing point of contention. A debate on the issues of DNA barcoding was held at the fifth biennial conference of the Partnerships for Enhancing Expertise in Taxonomy (PEET) in September 2004 at the University of Illinois at Urbana-Champaign. The debate was moderated by Vincent Smith, and involved Paul Hebert, the lead proponent of DNA barcoding, and Kipling Will, a vocal barcoding opponent. As a follow up to this debate, two contrasting position papers dealing with DNA barcoding are provided in this issue, moderated once again by a contribution from Smith. On the pro-barcoding side, Hebert and Gregory outline what they consider to be the beneficial aspects of DNA barcoding for taxonomy and other biological disciplines, where as Will et al. provide an opposing perspective in which they argue that DNA barcoding will be detrimental to taxonomic science. Neither set of authors has been permitted to read the others’ contribution prior to publication. Image © 2005 by T. Ryan Gregory.